Remember my cute Fall Mini Stacker? Well, I also made a super cute Halloween Mini Stacker! I absolutely love this set, and it's one of my favorite pieces of my Halloween decor! I didn't take step-by-step photos of the process because it's pretty easy. Purchase a Mini Halloween Stacker kit from Fab Decor. Paint your blocks. You can paint them whatever color you want - I used black, Sour Apple green, and Dioxazine Purple. Let dry completely. Paint on a thick coat of silver FolkArt Extreme Glitter paint. Love that stuff! Let dry completely. Not kidding this time. Sand all the edges and corners for a distressed look. Optional - attach tulle and/or ribbon around the set like FablifyIt did. So cute! I also put together this fun Trick or Treat block set! Similar steps as the Halloween Mini Stacker... Just bigger! 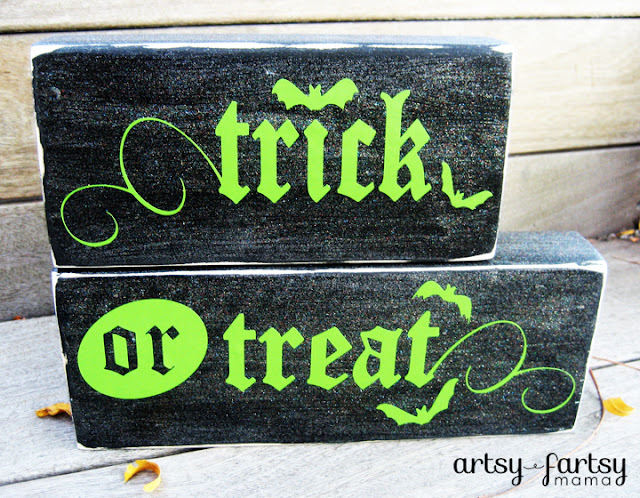 Purchase the Trick or Treat kit from Fab Decor. 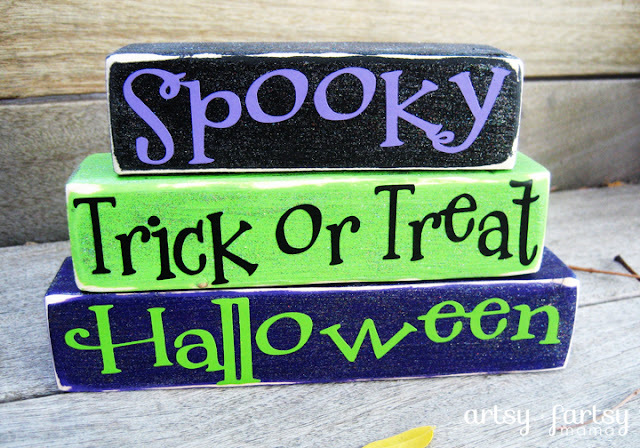 Paint blocks your favorite Halloween color. Purple, orange or even white would be cute! The possibilities for customizing are endless, and that's one thing I love about these kits! Let paint dry, then add a thick coat of silver FolkArt Extreme Glitter paint. Optional - Add tulle and/or ribbon as seen here at FablifyIt. you can also purchase the finished sets at Fab Decor!